Our MP dips a Piezometer! Eleven 4-5 metre deep piezometers have been installed along the main route and monitoring continues using a purpose built reel and sensor device. During the installation of the boreholes the contractor Costain Geotechnical Services extracted soil samples using a series of special 1-metre long plastic lined steel cutting tubes, which were then removed for analysis to confirm the make up of the ground adjoining the stream (the geology of the Thames Valley typically comprises layers of chalk, gravel, sand and clay). The boreholes have been used since late 2007 by volunteer members to capture and chart the movement in ground and stream water levels in the area over time. 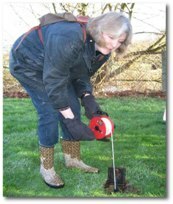 Boreholes (piezometers) were drilled into the ground adjacent to the stream to allow monitoring of groundwater levels. The 11 boreholes are measured ('dipped') each month using a special reel and sensor. In addition, 8 readings are taken of the surface water level at points adjacent to the boreholes. The readings have all been recorded and can been viewed via the links below. They are in a PDF format and give two types of information, one is the data reading with the date that the reading was recorded and the other displays the data in a graphical form. Monthly and long term average Rainfall data, provided by Reading University, is also shown. The 11 boreholes are identified by a letter of the alphabet from A to K with some having a number in addition. They start with borehole A, near Green Lane at the south end of the stream, continuing through to K3 at the northern footbridge over the stream at Town Moor. 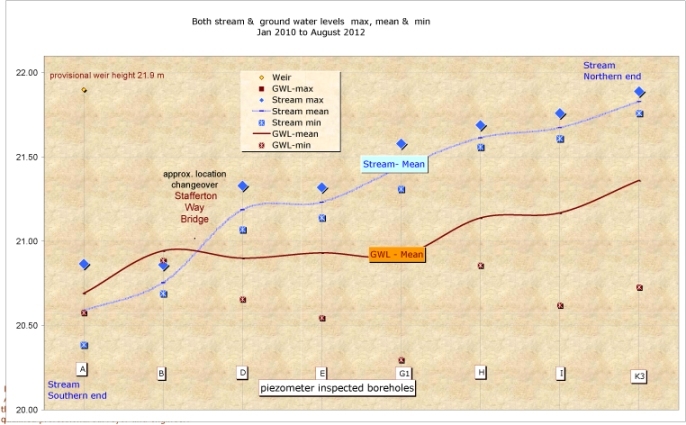 The graph below clearly shows the channel gradients (falling over 1 metre between Town Moor and Green Lane) and how stream and ground water levels change along the route. The full data will help our professional advisers to understand the stream hydraulics, linkages between rainfall, stream and groundwater levels - and in particular the likely impact of our proposed changes to the channels.